A bleak futuristic setting, a tyrannical government that holds dominance over the people, and courageous young people fighting to change the tide. Yes, I’m talking about the YA / Teen dystopian novels that were the prominent a few years back. While there were many out there (in publication) that spun a tale like this, none were more famous than Suzanne Collin’s The Hunger Games trilogy, Veronica Roth’s Divergent trilogy, and James Dashner’s Maze Runner trilogy. Naturally, seeing the popularity and lucrative money-making opportunity to the masses, Hollywood quickly snatched up the movie rights to these three-novel series, punching out cinematic franchises for each one. While The Hunger Games (a four-film series) was celebrated and completed Collin’s tale of Katniss Everdeen on the big-screen, The Divergent Series, telling Roth’s story of character Tris Prior, failed to impress its viewers and felt the tale being told uncomplete after its third installment. As for the movie representation of Maze Runner series, following the plight of Thomas and his fellow Gladers, this cinematic series falls somewhere in the middle of those two, finding a better groove in its dystopian action than teen drama romance (i.e. The Hunger Games Series and The Divergent Series). 2014’s Maze Runner, the first film in the franchise, was faced with mixed reviews, but more on the positive side as the movie itself was able to stand out more than its competition with its more intense sci-fi dystopian action. The movie went on to accumulate $384 million at the box office (worldwide), which gave a more favorable chance at the film’s sequel to profit. This second installment did materialize the following year with 2015’s Maze Runner: The Scorch Trials, further continuing the adventures of the Gladers in the journey to uncover the evil organization WCKD’s nefarious plot. Again, the film had some mixed reviews from critics, but was generally more accepted by moviegoers, with the movie grossing over $312 million at the worldwide box office. Now, after three years and a delay to the project, the dystopian world of Dashner’s cinematic tale of Thomas, Newt, Minho, and the rest of the Gladers comes to end as 20th Century Fox and director Wes Ball present the film Maze Runner: The Death Cure. Does this final chapter in the Maze Runner series bring a resounding conclusion to this YA / Teen dystopian or is it “too little, too late” for audiences to care about the fate of the Dashner’s Glader characters? After Teresa (Kaya Scodelario) betrayed her Glader friends, which lead to capture of several of them including Minho (Ki Hong Lee), to the organization known as WCKD, Thomas (Dylan O’Brien) and his friends in the “Right Arm” (a resistance group against WCKD’s rule) seeks to free their imprisoned friends and flee to an island paradise away from WCKD’s iron grip. After a completing a daring rescue to save teenagers from a WCKD transport, Thomas and company learn that Minho was not among the rescued survivors. 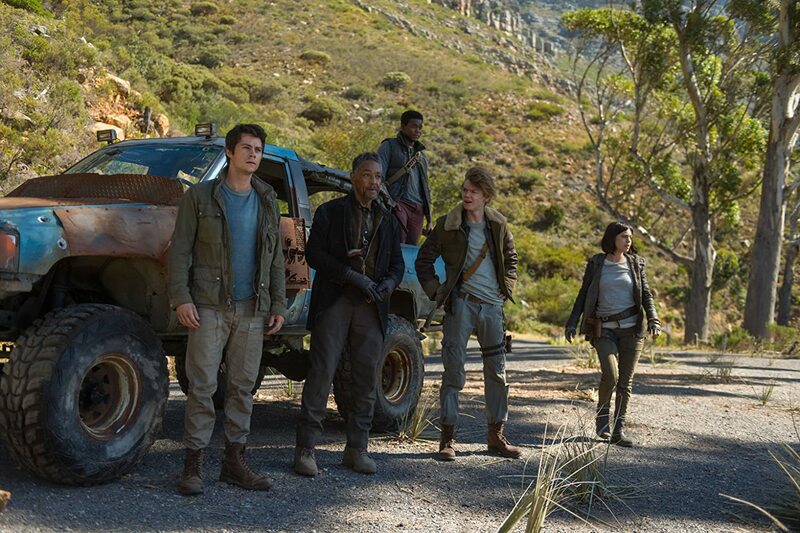 Splintering off from Right Arm’s main group led by Vince (Barry Pepper), Thomas, along with his fellow Gladers Newt (Thomas Brodie-Sangster) and Frypan (Dexter Darden) as well as their allies Jorge (Giancarlo Esposito) and Brenda (Rosa Salazar) lead a final rescue attempt to save Minho by journeying to the “Last City”, the stronghold to WCKD organization. 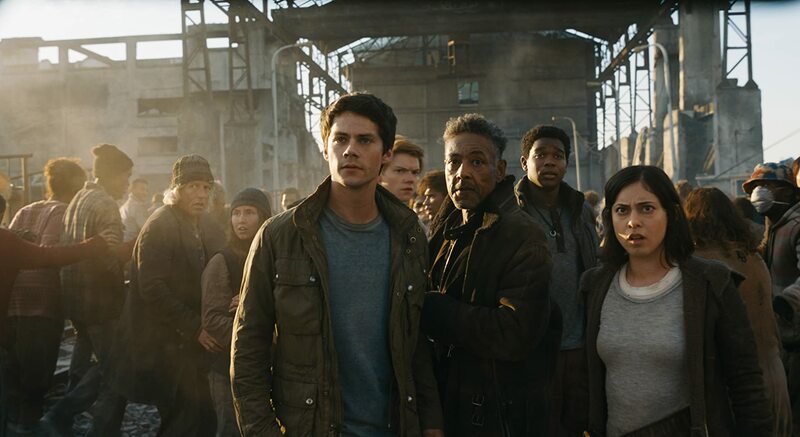 Once they arrive at the city, the group finds that WCKD has built walls to keep out those infected with the Flare virus. Seeking a way into the fortified city, Thomas and his allies come across an old friend (of sorts) and make an ambiguous deal with a man named Lawrence (Walton Goggins), who’s men are preparing for an attack on the city itself. While Thomas sneaks into the city and hatch a plan to save Minho, Teresa as been working with WCKD’s Ava Page (Patricia Clarkson) and Janson (Aidan Gillen) to find a cure that will save humanity from extinction via the Flare virus. Facing innumerable obstacles and testing the loyalties of both friends and enemies, Thomas and his allies work together to save their friends and finally escape from WCKD once and for all. Oh, the teen dystopian settings and the YA novels that tell their tale. Personally, I liked them, especially since they replaced the paranormal romances vampires, werewolves, and demon hunters (basically the “Twilight” era). Naturally, like many out there, I did read the three big dystopian series (i.e. The Hunger Games, Divergent, and Maze Runner) and definitely was looking forward to all the feature films that were gonna take this bestselling literary teen dystopian adventures to the big screen. To me, I liked Collin’s The Hunger Games series the most, so I ideally looked forward (and liked) the film series of the popular novels (even the mediocre Mockingjay Part 1 endeavor). In the end, The Hunger Games was able to complete its story fully and was great from start to finish. The Divergent Series, however, which was based of Roth’s novel, faired much less, as the film franchise started out strong and just (quite simply) peered out, never cinematically telling the conclusion to the story (perhaps the greedy reason of spilt Roth’s final book into two separates movies was a contributing factor). Regardless, The Divergent Series (as it stands) remains incomplete and a disappointment from such a popular book series. The Maze Runner film series, which was based off of Dashner’s novels, was (like I said above) somewhere between those two movie franchises, finding its sci-fi dystopian action more in focus than sappy teen drama (something that The Hunger Games and Divergent settled in both in the books and films). Personally, I liked the Maze Runner movies, finding the first film to be a great teen-based sci-fi action set-piece as well as its follow-up sequel, which continued and expanded the tale of Thomas and his fellow Glader comrades. These two films aren’t the absolute best (they have their fair share of problems), but both Maze Runner and Maze Runner: The Scorch Trials still have enough spectacle and engaging entertainment value to peak my interest in the world of movies. As to be expected, this comes back to for my Maze Runner: The Death Cure, the third and final installment in both Dashner’s novel series (although he did write two prequel novels after Death Cure) and in the Maze Runner movie franchise. As I said, the previous two Maze Runner movies held my attention and I liked them and was looking forward to seeing The Death Cure materialize on-screen to bring this tale to its cinematic conclusion, especially after satisfying ending of The Hunger Games: Mockingjay: Part 2 was released and the disappointing incompleteness of The Divergent Series: Allegiant failed to impress. However, while the film was set for an original release date of February 17th, 2017 (more than year since the 2015 release of The Scorch Trials), the third Maze Runner film faced a significant delay due to the on-set injury of actor Dylan O’Brien (who plays main protagonist Thomas in the movies). This injury during production caused the film to be delay an entire year while O’Brien recovered from his injury. With the release date pushed back until January 26th, 2018, my anticipation (as I’m sure a lot of people out there) sort of slightly dissipated, with now almost a three-year gap (or at least two and half year gap) since the last film. Still, my interest did peak again as they film’s release date approached and seeing several of the movie’s trailers (both online and in theater). But would that be enough? So, I did see The Death Cure when it initial came out during its opening weekend, but physically doing my review for the movie sort of fell through the cracks…. until now. So, what did think of the movie? Was it a satisfying conclusion? In truth, yes it was. Despite some drawbacks here and there, Maze Runner: The Death Cure provides to be an action spectacle finale piece to the YA dystopian tale. It may not beat out The Hunger Games: Mockingjay Part 2 within the teen dystopian film genre, but at least it gets to complete its story (unlike The Divergent Series). As a somewhat disclaimer to this review…. yes, I did read James Dashner’s Maze Runner trilogy when it was initially released. However, it’s been some time since I’ve read the books and my memory is a bit hazy on certain things. I remember most of the big events that occur in the story, but a bit vauge on the finer details. Thus, my review Maze Runner: The Death Cure is mostly on the movie’s cinematic representation and not so much on the comparison between “book and film” on what was added, removed, and omitted during its translation. Maze Runner: The Death Cure is directed by Wes Ball, who previously directed the other two Maze Runner movies as well as several short films (i.e. Jacob: The Movie, A Work in Progress, and Ruin). Given his background on working on both 2014 and 2015 film, Ball seems like the best candidate to helm Death Cure in closing out the Maze Runner movie franchise. Personally, I kind of like this notion as a film director gets to see his project (i.e. the Maze Runner series) through from start to finish. This, of course, makes Death Cure have the same look, tone and, feel much like the other two Maze Runner pictures, which (to me) is a good thing. Much like the previous two films, Ball gives the tale of Thomas, Teresa, and the rest of the characters a big grand finale that delivers on being spectacle with its various action set-pieces to intense storyline elements. From an opening salvo rescue operation on a moving train to the assault on WCKD’s stronghold within “The Last City”, Ball handles the movie’s action quite well, making sure that a viewer’s attentions (eyes and ears) are set directly on what’s going on in the movie. Basically, if you like the other two Maze Runner movies, you’ll be pleasantly happy and satisfied with The Death Cure, especially since it the film caps off the series’s story and resolve the main conflict of Thomas and WCKD. At its core, the film is a rescue mission, but combines other elements to make most of the narrative threads tie together and ultimately collide as the movie reaches its climax. This is thanks to T.S. 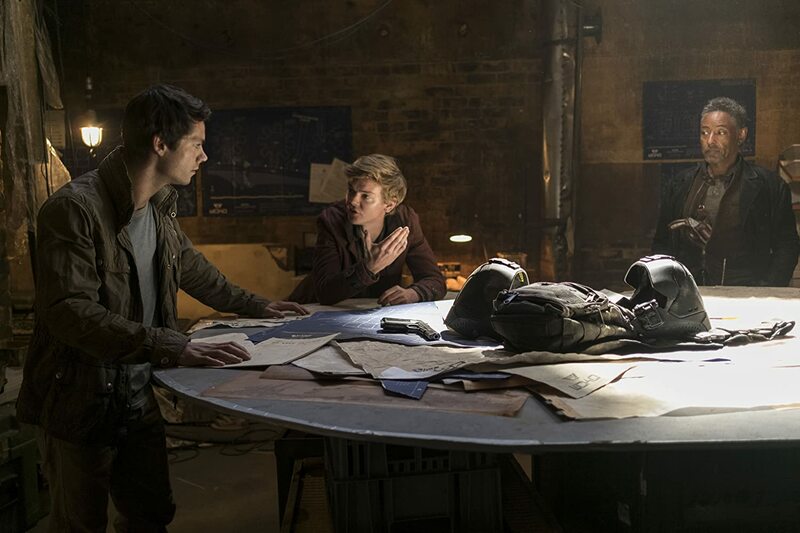 Nowlin, who penned the script from Dashner’s novel, making the narrative for The Death Cure on an energetic momentum level, building upon each other with the film’s progression being propelled to a collision course conclusion. The movie does slow a few times, but that’s mostly for character development and / or to explain certain things, but the film doesn’t slow down and / or sluggish by doing this, maintaining its pace for primarily most of The Death Cure’s runtime (which is two hours and 23 minutes long). That may sound long but given the fact the movie as a lot of ground work to cover, especially since studio exces behind these movies decided to stick with one movie to tell The Death Cure story instead of a two-part feature endeavor. However, personally, it didn’t bother me as I was engrossed in the movie’s story, especially since I couldn’t remember much of what happened in the book. In the presentation category, The Death Cure is pretty good, especially when being categorized in both the blockbuster visual aesthetics and in the teen dystopian fantasy world. It’s interesting to point this out as each film as a different color aesthetic for most of the individual film’s runtime, finding Maze Runner to have more greens, browns, and variety of earth-tone colors, The Scorch Trials has more rock-ish earth coloring (reds, light browns, dull orange / yellow), and The Death Cure has more of a midnight blue coloring (black, blue, gray, etc.). It’s not really a bad thing, but its just a fun observation that each film has a distinct coloring nuance for their respective parts. Moving beyond that idea, the film boast large set-pieces and elaborate sequences that must be well-executed for cinematic purpose, which makes the jobs for both Daniel T. Dorrance (production designer), Gyula Pados (cinematographer), Anneke Botha (set decoration), and the entire art direction team crucial to making this bleak futuristic world believable within the context of a motion picture. To their credit, they all succeed, making The Death Cure’s world pleasing to the eye and adding that extra layer of quality within the film’s background setting. Additionally, the film’s score, which was composed by John Paesano, is actually pretty good (I’ve personally downloaded a few of the tracks on iTunes), continuing to add the theatrical element through the usage of music that heightens its rousing moments from its actions scenes to its more quiet / somber ones. While The Death Cure succeeds in building momentum in its dystopian finale with its large set pieces and spectacle action, the movie does falter in certain areas, which do dilute this third installment from being truly great. Much like the other two movies in the series, the film doesn’t heavily focus on the development of its characters. Yes, while I do praise it for another being bogged down in syrup teen melodrama romance, most of the characters in the feature are, more or less, one dimensional, filling out the roster. However, with Ball at the helm for The Death Cure (and with his previous work on the other two films), I had a feeling it won’t change in this movie. That being said, I kind of wanted more closure with some of these characters that what was presented in the feature…. but more on that the below paragraphs. Running parallel to that idea (and more of a prevalent negative in my mind) is the context of the overall arching narrative plot in the franchise. While Ball (along with Nowlin) adapt Dashner’s novel for the base of the movies, they never give a clear and concise layout of the what the Flare virus is and (especially in this movie) what is exactly WCKD plans to do with the suppose of “cure” for the infection. The film presents a motivation for the evil organization, but it’s a bit vague in its handling and never fully materialize in the movie. Thus, in a nutshell, Ball never fully evolves the conflict story of Thomas (and friends) against WCKD’s nefarious way beyond the cliché standards. In conjunction with that idea, the movie (or rather the Maze Runner series) explores the thematic theme of what humans will go in order to survive as well as what that means for their humanity. Yes, its indeed a power theme to reflect upon, especially a common one found in most dystopian sci-fi adventures in both teen and adults tales. 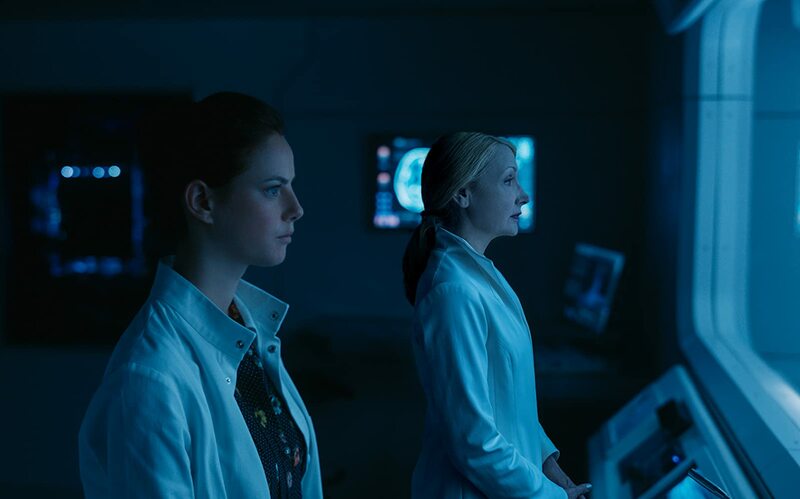 Unfortunately, much like the movie story, The Death Cure is only a surface-level examination of this idea (again, The Maze Runner movies are more focused on the action versus a more thought-provoking agenda on the wither-tos and why-fors of what’s going on). Relating to both of those points is the fact that The Death Cure arrives a bit too late to its own dystopian motion picture party. What I mean is that the crazy for adapting teen dystopian novels into film franchise has come and gone. The Hunger Games: Mockingjay Part 2, the final installment in the movie series, was released in 2015 and The Divergent Series finished its run with Allegiant back in 2016. This goes back to the fact that The Death Cure arrives too late, with many viewers (presumably) not so quite enthralled in the tale of Thomas and his fellow Gladers concluding their battle against WCKD. Of course, I’m talking about the film’s delay in its release as if the whole “movement” in teen / YA dystopian stories (both in literary form and in cinematic form) have passed, becoming another outdated fade from pop culture. I’m not saying that The Death Cure is enjoyable and entertaining, which I do like, but the movie’s release comes at a time that can’t fully capitalize on its viewers’ interest, who have probably moved on and away from tyrannical governments and courageous teenagers. Another minor problem I had with The Death Cure was the simply fact that a lot of scenarios (in the film) happen on pure coincidence and in sheer luck. While that’s not necessarily a bad thing, but the some of the parts of the plan that Thomas and his friends hatch up succeeds in some random dumb luck of coincidence of events and (to be honest) should not theoretically happen. I know that sounds like a minor negative quibble to make, but, if you see the movie, you’ll know what I mean. You may even roll your eyes a few times on those scene, thinking “oh, come on, man”. The cast of The Death Cure is pretty good, with almost every retuning character from the previous installments reprising their roles effectively and in both acting talents and in character continuity reasons. However, with the main plot being the driven force for much of these movies, The Death Cure does lack (in a few characters) a sort of well-roundness within its large cast. Of course, this can be a problem due to the action spectacle over development substance and certainly does. Could’ve a bit more depth and character insight been beneficial? Yes. However, I felt mostly satisfied at what was presented within these characters, especially (again) since the movie had a lot of ground to cover from start to finish. At the head of the pack is actor Dylan O’Brien who plays the Maze Runner’s main protagonist hero character Thomas. Known for his roles in Teen Wolf, Deepwater Horizon, and American Assassin, O’Brien does certainly handle himself well in the lead role, especially when it centers around a fictional dystopian world. O’Brien easily slides back into his persona of Thomas as a character who epitomizes the endurance of humanity and what it means to do the right thing, even though it might put himself in danger. Again, this character archetype hasn’t been played out before in other mediums, but ultimately works in favor in the Maze Runner movies as well as O’Brien filling out the role. The other main protagonist (or rather antagonist to some) is the character of Teresa, who is played by actress Kaya Scodelario. Known for her roles in Now is Good, The Truth About Emanuel, and Pirates of the Caribbean: Dead Men Tell No Tales, Scodelario is okay in the role (nothing grand, but not horrible) and does get the most character development in the movie (of all the character), with a redemption arc within her character of Teresa, who is conflicted from her betrayal act in The Scorch Trials and what she believes she WCKD is doing. There are a few moments that both O’Brien and Scodelario share a romantic connection in the movie and, while it’s the greatest on-screen chemistry I’ve seeing, it’s enough to make their connection believable. In the villain category, actor Aidan Gillien (Game of Thrones and King Arthur: Legend of the Sword) and actress Patricia Clarkson (Easy A and Far from Heaven) reprise their roles as WCKD’s bigwigs Jansen and Ava Page. Both Gillen and Clarkson are perhaps the most seasoned acting veterans in these movies and it clearly shows, finding their overall theatrical gravitas anchoring this film. As for their character development, both are still a bit one-dimensional baddies (both of which have different ideal goals), but still drumming up the classic “the ends justify the means” in their ways to ensure survival for them. That being said, what’s presented is enough to suffice to the narrative structure of these films and in The Death Cure as well. Of the other main supporting players of the feature, actor Thomas Brodie-Sangster (Game of Thrones and The Last Legion) gets the biggest spotlight in the feature as Thomas closets fellow Glader friend Newt. 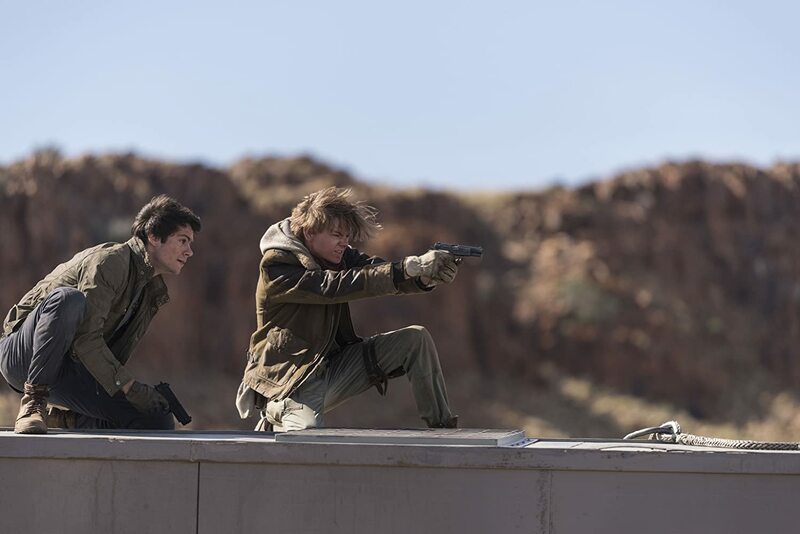 To be quite honest, Brodie-Sangster delivers one of his best performances of the three Maze Runner films in The Death Cure. There is another actor that has a good role in this movie (who makes a return from one of the previous films), but I won’t spoil it on who it was. Suffice to say, that his return to the character is good and a welcomed one, but acts more like component in the film’s plot progression…. I would’ve liked to seeing more of him and have moment of character growth. Others Gladers including, actor Ki Hong Lee (Everything Before Us and Wish Upon) as Minho and Dexter Darden (Joyful Noise and Geography Club) as Frypan, return for The Death Cure, adding to layer of continuity and in the context of the Maze Runner series. Lastly, actor Giancarlo Esposito (The Jungle Book and The Usual Suspect) and actress Rosa Salazar (Night Owls and Altia: Battle Angel) return to reprise their character roles of Jorge and Brenda, but are, more or less, downgraded from the appearance in The Scorch Trials in The Death Cure. There still prevalent in the film, but not so much in the forefront of main characters. Still, there inclusion is a welcomed one. The rest of the characters in The Death Cure have small / cameo-like roles in the feature. This includes actor Barry Pepper (Saving Private Ryan and Enemy of the State) as the Right-Arm leader Vincent, actor Walton Goggins (Justified and The Hateful Eight) as the disfigured leader of a rebellious group that plans an assault on “The Last City” named Lawrence, actress Nathalie Emmanuel (The Fate of the Furious and Game of Thrones) as Right-Arm member Harriet, and actor Jacob Lofland (Little Accidents and Mud) as the other Glader from a different maze trailer named Aris. While all of these individuals acting ability are solid (most of them I like in other projects) are merely in the movie for continuity purpose and / or fill-out one or two certain scenes within the narrative. Thus, the characters aren’t really fleshed out and more servants to The Death Cure’s plot or to the main / supporting leads of the feature. Every maze has an end and does the tale of Thomas, Teresa, and their fellow comrades and friends reaches its explosive conclusion in the movie Maze Runner: The Death Cure. Director Wes Ball’s latest film adapts the third installment in James Dashner’s bestselling Teen fantasy series, bringing an action-pack ending that sees the title characters launching a rescue mission to save a friend and to bring WCKD down once and for all, While the movie does suffer from being overstuffed and lacking certain elements in both story and character development, the film succeeds in being a grandiose finale to the series, drumming up intense big-time action and is an entertaining ride from start to finish, bringing an engaging conclusion to this three-part cinematic tale. Personally, I liked this movie. Sure, the movie had its problems and could’ve been a slightly better, but it still held my interest (quite firmly) and was really fun movie to watch, especially since it fully completes the story being told unlike The Divergent Series. To me, this was my favorite Maze Runner film of the trilogy. Thus, I would say that I would “recommended” this movie, especially for those who love the series (both the books and films) and / or the other teen dystopian endeavors out there. In the end, Maze Runner: The Death Cure closes out the Maze Runner cinematic franchise on a good and positive note. Does this mean there will be more Maze Runner films in the future (Dashner has written two other Maze Runner novels that are set as prequels and the movie does hint at a possible continuation. At this time, it’s hard to say. Regardless, Maze Runner: The Death Cure holds its place tightly and firmly in being a spectacle finale, closing out the story that began back in 2014 on satisfying note. The tale of Thomas and his fellow Gladers might’ve been a rough and arduous journey against their many trials and the dealings with WCKD, but the films that tell their story are indeed teen dystopian movie escapism at its best…. right down to the WCKD end! Haha….that’s how it usually goes. Like i said, I’ve read the books, but that was a long time ago.